House and time at Malvern: No 7, 1895 - 1897. Regiment: 39th Garhwal Rifles (I.A.). Died: 10 March 1915 aged 34 in France. Killed in action at Neuve Chapelle. Born 6th May 1881 at Madras. Son of Lieut.-Colonel E. E. Kenny (Indian Army), 1 Esmond Road, Chiswick, and Elizabeth Kenny, of Highlands, Roundham Hill, Paignton, Devon. Army III—II. Exhibitioner. House XI Football. R.M.C. Sandhurst; Hampshire Regt. 1900; West Yorkshire Regt. 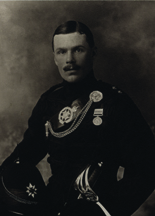 1901; Indian Army (39th Garhwal Rifles) 1902; Captain 1909; South African War 1900-01, Queen's Medal with 4 Clasps. After joining the Army he qualified as 1st class Interpreter in Russian, and also passed the Lower Standard in Persian with a view to becoming an interpreter. He accompanied his regiment to France in October 1914, and led his men into a German trench at Neuve Chapelle where he was twice wounded, and then killed by a shot in the head.